xplorer² is what windows explorer should have been. We've kept the best bits and threw away the inconsistencies and irritations, all in a small and nimble, easy to use package. At first glance everything looks familiar: the classic tree/view user interface, clean and clutter free, should get you started immediately. xplorer² will get you in all places you keep your digital wealth, including namespace extensions like FTP, zipfolders, webfolders (webDAV), digital cameras etc. But that's where the similarities end. 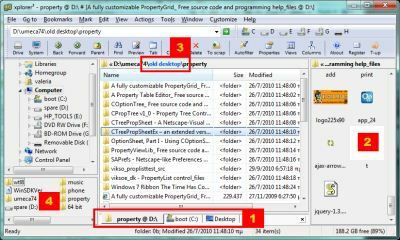 Unlike explorer, xplorer² allows you to browse more than one folder at a time, using tabs  and dual panes . Sorting out and copying files becomes a breeze. You can navigate your shell namespace quickly using favorites, clickable paths (breadcrumbs) , easy access to root folders (drivebar), a tree and a bookmark pane  (drop box) etc. You can even save and restore folder groups whenever your workflow deems necessary. xplorer² browsing model scales up well to large folders with thousands of files. It reads fast, offers visual filters and a variety of selection mechanisms that allow you to manage your files effectively. You can browse your folders in all usual view modes, including thumbnails and arranged in groups.